The Vision Splendid is a comfortable 3 hour drive north of Melbourne via the Hume Freeway and Great Alpine Road then to Beechworth. Just a few minutes to the Buckland Gap (Myrtleford road) then about 7km to right turn at Fighting Gully road- follow Map for 1.5km. Our 34 acre venue is suitable for individual stay or events and celebrations. There is plenty of space for kids to play ball games,run about and explore. As soon as you enter the driveway The Vision will start its magical effect on you. As the panorama unfolds before your eyes your worldly worries will ease then melt away.FREEDOM to RELAX or PLAY!!!! 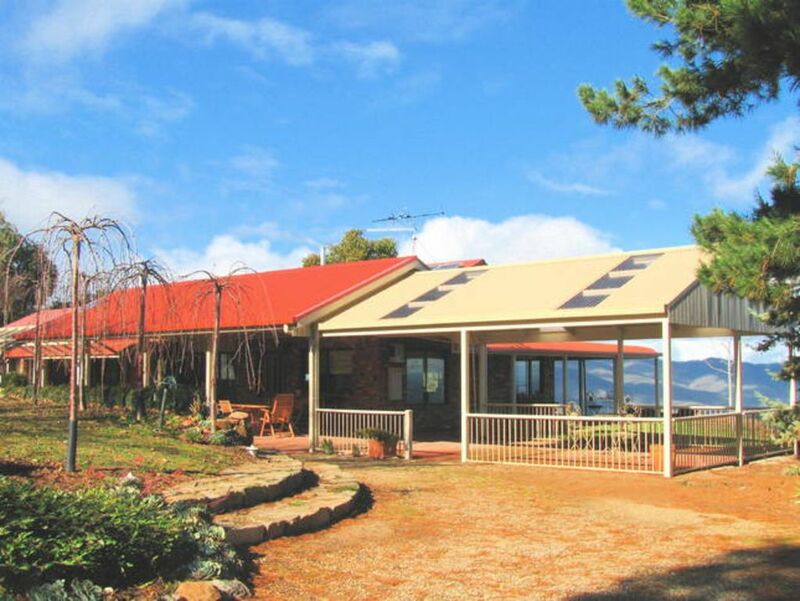 Imagine lying in your comfortable bed looking over the Ovens valley as you enjoy a coffee! Hear our resident native birds.Watch wedge-tailed eagles soar! Trusting Blue wrens busy outside your window all day! See the morning sun illuminate the majestic rocky crags of Mt Buffalo then the Folded Hills and forested foothills around the vast amphitheatre. Mists form and evaporate, cloud patterns too! A massive patchwork of farmland lies 250m below stretching a hundred kilometers or more to the Victorian Alps to the south (snow-capped in winter). Sip a chilled local chardonnay on the veranda- relax and enjoy peace and tranquility VISION STYLE!! Sunsets are memorable as well from our "Sunset Seat" Bring your camera and binoculars. All just a 5 minutes drive from historic Beechworth gold town-its pubs and restaurants, classy shops, regional gourmet foods and wines,bike trails and much more. This accommodates up to 15 persons. Homestead-up to 7 persons. The 2 self-contained rooms up to 4 persons each. (all can be individually let.Charge rate $600 per night is for 10 persons,with a 2 night minimum.Extra charges apply per person beyond that. Four bedrooms feature floor to ceiling windows with views to the Alps and access to the veranda with table setting outside and the 5th cozy (Garden) room has a delightful outlook on our lovely gardens. All rooms have super-comfortable mattresses with latex pillowtop. The Homestead has a master bedroom (with view) queen bed and ensuite ,another bedroom with queen size bed(and view) and the Garden Room with 2 single beds and one trundle bed.These single beds can be combined into a King bed.There is a large bathroom with bath and shower for the Garden Room and the other (view) bedroom. The 2 self-contained rooms have queen bed, single bed and trundle,large bathroom, a table setting and view windows accessing the veranda. Full HD DVD Television with SD card and USB game input too! Eco-Lodge-committed to a low carbon footprint! We aim for a low environmental impact-but with luxury living! Our water is collected rainwater with a spring water supplement when needed and for the gardens, vineyard olive grove and orchard.Conservation of water is vital for us! The property has a 1kw Grid-feed Solar Panel rooftop electricity generator. Homestead hot water is provided by rooftop Evacuated Tubes linked by woodfire thermosyphon to a 500 litre ceiling storage tank.This also feeds passive individually controlled warm water radiators (allergy free)in each room-boosted by a Quantum Eco heat pump in winter. Hot water for the 2 self-contained rooms is also from Quantum "Heat from thin air" technology-super efficient! Air conditioning in the living area is inverter technology with 4 and 5 star efficiency.The self-contained rooms are double-glazed and also efficiently air conditioned. All bedrooms are airconditioned. Lighting throughout the property is CFL and LED technology with outdoor spotlights powered by solar panels as is decorative garden and driveway guidance lighting. We have installed the award-winning Australian Biolytix water treatment system which uses a riverside ecosystem principle in an underground tank to treat waste water (no chemicals) and then irrigate and nourish our lawns and vineyard via advanced subsurface irrigation.All household water is thus used twice! All indoor water facilities are conventional-water flush toilets,showers bath, basins, insinkerator etc! Our fishpond fountain and waterfall is also solar powered- a native bird magnet too! Our large eucalypt plantation supplies wood for the wood fire as well as carbon offsets for your stay. What a place; the views are amazing, it has a well set up fire pit area, plenty of room for kids both inside and out. Suited our group of 12 perfectly! Second time our group have stayed here and we'll come again. Sitting in the back with a glass of wine, watching the sun set over the view was fabulous. Well equipped kitchen and lounge room and plenty of outdoor space for a big meal. Used the pizza oven this time too. It's a rambling place with odd nooks and crannies and what not to like about that. Welcoming hosts. And plenty of hot water too! We loved our stay at The Vision Splendid. They 'eye candy', (the views) was spectacular. The facilities were great. Small things could improve it of course, but on the whole, it was well presented and had everything we needed and more. Maurice and Jill were great hosts and we thank them for their care and welcome. The only suggestion we would make is that instructions to the wood heater, the micro wave, dishwasher and oven would be really handy, and an information booklet about their sustainable projects would be really interesting. Great views but didn't look like the pictures. The view across the valley was lovely but I was disappointed to find the house surrounded on 2 sides by plastic sheeting preventing views of the garden. I asked if it could be removed and was told not to touch it. Also the views from the separate rooms were obscured by building works and orange builders netting. With tattered tables at the front door, a discarded child booster seat and plastic table cloths on the dinning tables (only when we started removing them were we provided with a table cloth from a recent wedding) my overall impression was that this propety was a bit tatty and over priced. Would be suited to young children. The view is one of the most beautiful things I have ever seen. Especially at sunset. Lovely house, fully equipped. All around, best New Years EVER!